Winner of the 2016 Junior Manx Grand Prix, racer Andrew Dudgeon is set to make his debut at the 2017 Isle of Man Tourist Trophy race, often hailed as the world’s most extreme race. Racing since 2009, the Isle of Man native’s career has been on the rise ever since he won the 2012 MGP Newcomer’s B race. Since then, Dudgeon has collected various wins, including 2nd place at the Senior Manx Grand Prix 2016, 1st place at the ARA Club Championships 2016, and 2nd at Thundersport GB 2016. 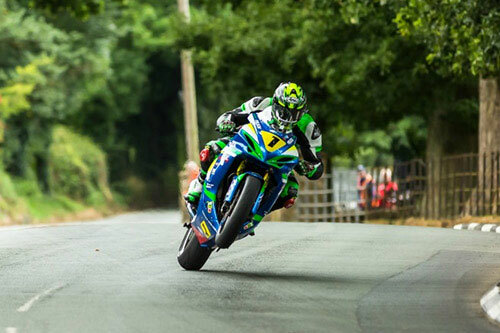 He will be riding his Suzuki GSX-R 600 for the Supersport races and the 1000cc ZX10R Kawasaki for the Superstock and Senior races at the Isle of Man races. Dudgeon is sponsored by Lotteries.com, a fast-growing online lottery betting site, who believe that Andrew has the makings of a future winner. Fans are invited to join Andrew along for the ride. Besides following him throughout the races, Lotteries.com will unveil a special lottery betting syndicate in Andrew’s honour and hold a special draw, giving fans a chance to win a limited edition racing helmet. Lotteries.com is also sponsoring a Manx F2 Sidecar Team, Melvin Racing, consisting of Craig Melvin and Stuart Christian. Fans are invited to join the racers on their Facebook pages @andrewdudgeonracing and @melvinracing82. Lotteries.com is an online betting site where you can safely bet on the outcome of your favourite international lotteries. Enjoy unique single and syndicate betting options on the world’s biggest jackpots such as American Powerball, Mega Millions, El Gordo, Oz Lotto and more. Owned and operated by International Multi-Media Entertainments Limited, Lotteries.com is licensed and regulated by the UK Gambling Supervision Commission and is run by professionals with over 26 years of industry experience. Lotteries.com also provides the highest standards of protection in online gambling. When you register for an account, your information is encrypted by the industry-standard SSL (Secure Sockets Layer) technology. Lotteries.com is open to players aged 18 and over. 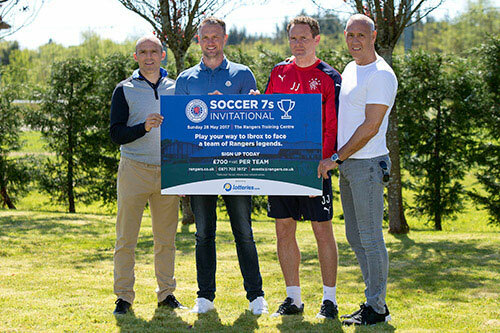 Soccer fans can live out their dream of playing against a team of Rangers Legends at Ibrox Stadium Glasgow, United Kingdom (PRWEB UK) 14 May 2017: Lotteries.com has announced its sponsorship of the Rangers FC’s Soccer Invitational, a round-robin tournament league on Sunday, May 28, where soccer fans will battle it out for a chance to face a team of Ranger Legends at Ibrox stadium. Soccer fans in the UK are invited to form 7-a-side teams with their friends, family or colleagues to play in an exclusive tournament at Auchenhowie, the Ranger’s training facility. Following a ‘round-robin’ league format, the tournament will kick off early in the morning on Sunday, May 28, with the quarter-finals, semis and the finals in the afternoon. The winning team will go on to play a game against a team of Rangers Legends, captained by John ‘Bomber’ Brown at Ibrox Stadium, home of the FC Rangers. This once-in-a-lifetime opportunity will take place at halftime on a match day next season where the winning team will also enjoy matchday hospitality. Lotteries.com will also make a cash donation to local UK charity Cash for Kids, for every goal scored at the final face-off. Liverpool, UK (PRWEB UK) 27 March 2017: Lotteries.com wrapped up its week-long St Patrick’s Day celebration in Liverpool, UK with a £1000 donation to the local UK charity, Cash for Kids. Cash for Kids supports disabled and disadvantaged children by providing services and specialist equipment to enhance their quality of life. During the week of March 12 – 17, for any line bet placed on Ireland’s National Lottery, the Irish 6/47, Lotteries.com donated £1 per line to charity. 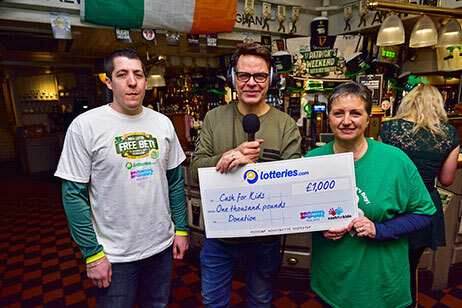 Cash for Kids representatives received the thousand pound cheque during a special St Patrick’s Day broadcast of Radio City 2’s Breakfast Show with Simon “Rossie” Ross. “At Lotteries.com, we strongly believe in giving back to the community. We want charity to be at the heart of our offerings. That’s why we teamed up with Cash for Kids,” said J. Evans, CEO of International Multi-Media Entertainments Ltd, which owns and operates Lotteries.com. Broadcast live from O’Neill’s Irish Pub in Liverpool City Centre from 6 am to 10 am, the doors were open to the public who watched the show unfold over free Irish breakfast. “I wanted to thank every one of you who helped us contribute to this great cause which is close to our hearts,” said Evans. 13 December 2016: Olé! A group of residents from the UK's smallest town are hoping to win big this Christmas as they take their chances on two of the world's biggest lottery games – Spain’s El Gordo and El Nino, which boast a combined prize pool of €2.3bn. Lotteries.com, the online lottery betting service which allows people to bet on lotteries from across the world, has formed a super syndicate consisting of 69 of the residents which, if lucky, could see them become amongst the wealthiest people in the UK. In honour of the Spanish games, it’s hasta la vista Fordwich and hola El Fordwich! 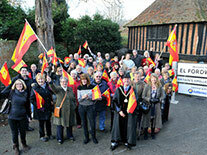 The residents of Fordwich, alongside Mayor Philip Lewis, have shown their support and wholly embraced Spanish culture by changing the town’s name to El Fordwich, as well its street names and signs. The town, which has the oldest working town hall in the UK, has also erected an urban beach and hosted flamenco dancing for all to enjoy. The local pub, George and Dragon has even changed its name to Jose and Dragon, and the town’s postmen have got into the spirit by wearing matador uniforms to deliver post. Philip Lewis, Mayor of Fordwich, said, “The residents are so excited to be involved, it’s great for our community and we enjoyed dreaming of our Spanish beach and flamenco dancing, bridging the gap of so many kilometres and drawing us closer together”. The town’s participation in El Gordo and El Nino has been made possible by Lotteries.com who celebrated their UK launch by donating a sum of money to the group of Fordwich residents. El Gordo takes place every year on the 22nd December in Madrid, with El Niño on the 6th January 2017. The Spanish Christmas Lottery is the second-longest continuously running lottery in the world, which includes the years during the Spanish Civil War. Lotteries.com gives players access to bet on the world’s largest jackpots. Those keen to participate in a syndicate and be in with a chance of claiming some of the biggest worldwide jackpots across the world, including Spain’s €2.3bn El Gordo game on 22nd December 2016, should visit www.lotteries.com. New players are being offered cashback on their first bet up to £50. Terms apply. Lotteries.com is a leading online betting service offering you the chance to bet on the outcome of a range of international lotteries. With a wide selection of the world's most lucrative lotteries at your fingertips, as well as opportunities for single or syndicate bets, you have more options than ever when betting with Lotteries.com. Lottery betting lets you place a bet on the outcome of a lottery draw, instead of buying a lottery ticket. For instance, if you want to bet on the Irish Lotto 6/47, you will bet on the results of the draw that takes place every Wednesday and Saturday. If the numbers you bet on win in any prize category, you will be paid out equal to the value of that category. Lotteries.com is owned and operated by International Multi-Media Entertainments Limited (IMME). It is licensed and regulated under the UK Gambling Supervision Commission for betting on real events and is run by professionals with over 26 years of experience. Lotteries.com provides the highest standards of protection in online gambling. When you register for an account, your information is encrypted by the industry-standard SSL (Secure Sockets Layer) technology. Stay up-to-date with your favourite international lottery games with our exclusive app for Android phones and tablets! The Lotteries.com app is 100% FREE and available for all Android-compatible devices!